A buddy of mine once made incredible smoked sausage using pork belly. He then took it out to East Texas for an event but was met with skeptical, hesitant looks. I guess if you’re not a foodie then the word “belly” isn’t the most pleasant description, so here’s all you ever need to know about pork belly: it’s bacon. But the really great thing about pork belly is that it can be so many other things aside from just bacon. You can smoke it, braise it, cure it… hell you can even hold it close and tell it how much you love it. 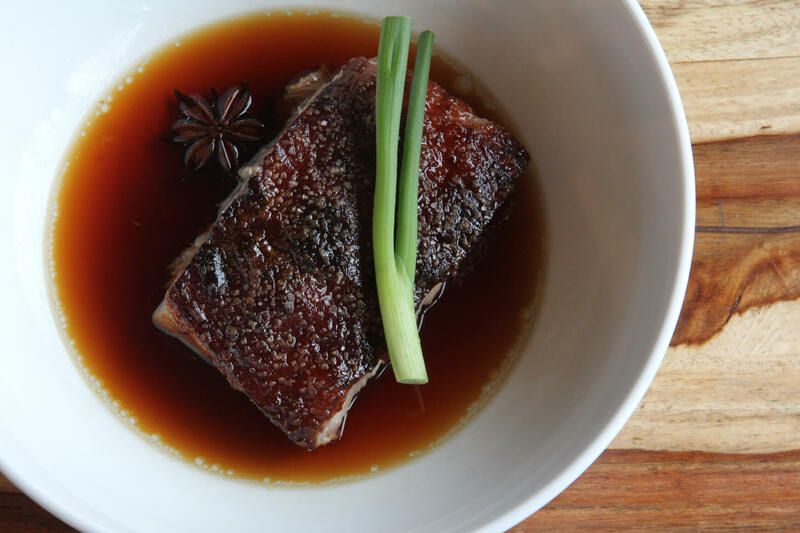 Pork belly makes a big appearance in Asian cuisine and I personally love the combination of flavors and aromatics they use. Most belly you’ll find will be skinless and it’s possible to caramelize the very top layer of the fat and turn it crispy. For a pork-rind level of crispiness, you’ll need to find a belly with the skin on and adjust your recipe accordingly. Serve with white jasmine rice and some stir fried greens and I promise you’ll be coming back for more. I find it easiest to obtain skin on belly from Asian grocers, but you can also splash out and try the “kobe beef” equivalent of pork – Kurobuta. The Kurobuta pork belly for this recipe was provided by Snake River Farms. The star anise and Asian flavors in this recipe make it a real winner. You'll need to start this recipe 24 hours in advance, so be prepared. For this recipe, I used Snake River Farms Kurobuta pork - a breed considered to be the Rolls Royce of pigs. 1 x 2-3 lb pork belly. 1 serrano or medium heat chili, split open. 24 hours prior to cooking, take the belly and rub generously with the dry brine mix. Place fat side down on a baking tray lined with several pieces of paper towel, and put in the fridge overnight, uncovered. Remove belly from fridge and scrape off any remaining brine. Pat the fat dry with a paper towel. Place the belly fat side up in roasting tray and place in over for 30 minutes. Combine vinegar, sugar, oil, water, soy and fish sauce. After the belly has been cooking for 30 minutes, reduce the oven temperature to 325f/160c. Pour the liquid mixture into the base of the pan so it covers the meat but does not reach the fat, taking care not to get any liquid on the top of the belly. Gently add in the chili, garlic cloves, ginger and star anise. Bake for a further 2-2 1/2 hours until tender. For an optional finish, turn the broiler on and blast the fat for 5-10 mins (being careful not to let it burn). To serve, reduce some of the pan liquid in a small saucepan, and pour into a serving bowl. Place a piece of sliced belly in the bowl, and garnish with chopped shallot. Serve with rice and Asian greens.